In the race to replace current Illinois State Treasurer Dan Rutherford, Republican Tom Cross continues to expand his lead over Democrat Mike Frerichs as a new poll out today shows. Tom Cross, who is running to restore a balanced budget to the State is leading 2:1 with independent voters and has a lead among women voters. 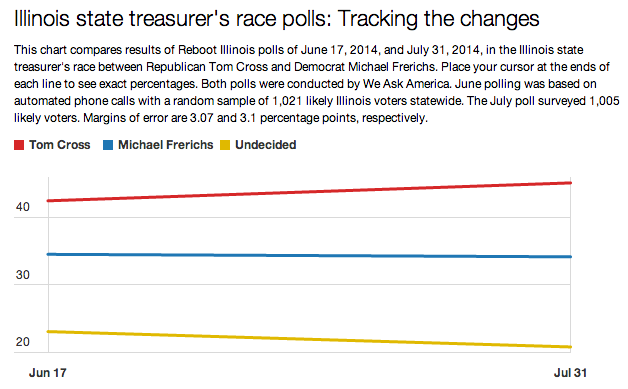 A poll released this morning from Reboot Illinois/We Ask America contained the latest piece of bad news for “Tax Hike Mike” Frerichs: Tom Cross is leading Frerichs by a margin of 45%-34%. Cross’s 11-point lead in today’s poll is up from a June 17 Reboot poll that showed Cross up +7. Despite Cross being from suburban Oswego and Frerichs from downstate Champaign, Cross held a 48-30 lead over Frerichs among downstate poll participants. Elsewhere, Cross held leads of 11 points in suburban Cook County and 57-27 in the collar counties. The poll also shows Cross leading +19 among men (50.6-31.7) and +6 among women (42.1- 35.5).